← [Flash Sale] Fantasy Creature Collection: Lachesis! Party before the party, the advent calendar is always a pleasure for both children and adults. On OhMyDollz, we prepared for you a beautiful advent calendar full of gorgeous gifts starting tomorrow! Do not forget to collect your gift each day until December 25th! 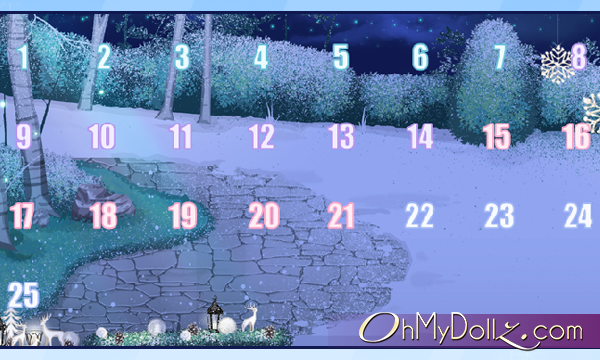 Each day, open a slot of your OhMyDollz calendar to obtain a nice gift in the Christmas spirit. Login in each day to obtain 25 free gifts. Each gift is available in 3 colors. While opening a slot, you get a random color! On December 25th, there will be only one gift with the “rare” tag. Attention: you can’t buy it in the lofts! Missed a slot or want to get all the colors? If you miss one or more days, you can open the slots of the previous days with 15 Fee’z for each slot. You can even open again a slot to obtain other colors for 15 Fee’z. You will receive a color that you do not have yet! If you have all the colors already, you will receive the same in more copies. I’d like to obtain a whole collection in a specific color, is it possible? You can obtain a whole collection in the color of your choice on the event page, using Fee’z. If you buy a “collection” in a specific color, you won’t get more copies of this color while opening the slots after this purchase. Attention: if you already opened the slots before this purchase, you can obtain more copies of the same items. So, if you want a complete collection in a specific color, it is better to buy this collection before the opening of the first slot of the collection. Important: This event requires the Flash plug-in to be active on your browser to open the slots. If you play on mobile, you can try the Puffin app to use Flash. This advent calendar will be available until December 25th 2017 at 11:59pm (Paris hour). Do not forget to open all the slots before this date! A rain of gifts is coming on OhMyDollz!